This is the time of year when SoCal hikers could chance upon these eight-legged wonders that inhabit local grasslands, chaparrals, canyons and deserts. We can’t think of a better way to celebrate the Halloween season by coming face to face with a creepy crawler. While the females stay nice and comfy in their burrows, the males are on the prowl. Usually nocturnal, the mature tarantulas (about 6-7 years old) venture out in the daylight looking for a Stella to play opposite their Stanley. With typical migration seasons running from September to October, folks who want to see these big beauts best plan in the next few weeks to trek outdoors. 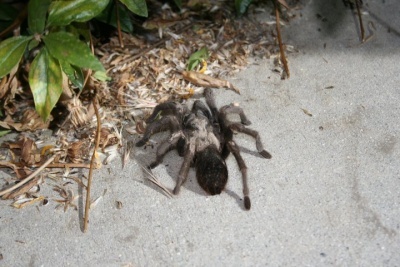 Gennet also reminds that despite their creepy reputation, tarantulas are very gentle and are not a threat to people. Sure, keep your distance with them (when threatened they can shoot out spiky hairs from their abdomens which are sharp and painful), but these critters aren’t going to chase you down. In fact, they spend most of their time underground sitting and waiting for prey to come by their burrows. Patience, thy name is tarantula. …We have three or four reported species; two are common. In Aphonpelma eutylenum (also known as Rhecostica) the males mature in the fall; A. reversum matures in mid-summer. Males and females are generally about two inches in length. Overall, tarantulas aren’t endangered and they have only one real predator: the tarantula hawk, a large wasp that preys on the hairy crawlers, paralyzes them and deposits eggs on or near it for their youngsters to eat when they hatch. AND…if you think tarantulas are creepy, wait till you get a glimpse of this creature. 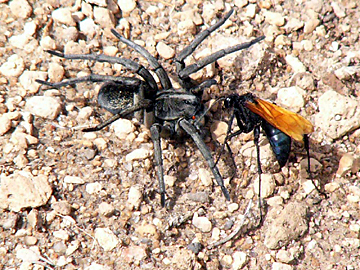 Tarantula and tarantula hawk battle it out. For the males, however, their soul mate can be their worst enemy. They often get fatally injured during mating and yes, the females have been known to eat the males afterward. For all their creepy manliness, these males mate pretty much once in their life. While it sounds like scientists know a lot about tarantulas, they are a little-researched critter. 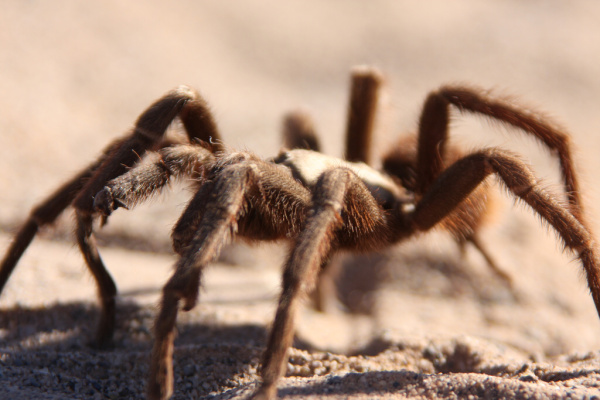 “Like other common wildlife, we really don’t know that much about them,” says Gennet about the secret life of tarantulas, which makes them even more the spooky and mysterious. And that’s just how we want our wildlife this time of the year…. One Response to "March of the Tarantulas"
Pingback: What’s That Bug? makes High Country News | What's That Bug?